This is the place to post any parts that you have for sale. It took two years to complete! At last, a service manual for the O.D. 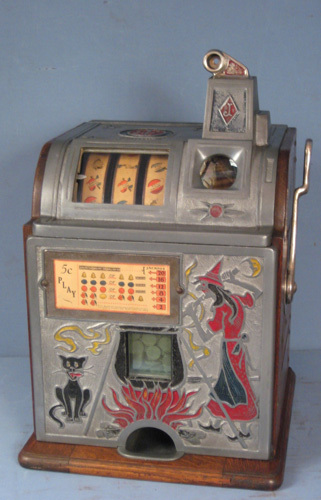 Jennings LITTLE DUKE & DUCHESS slot machines with over 120 pages and over 160 photos. This is actually a supplement to the book: “OWNER’S PICTORIAL GUIDE FOR THE CARE AND UNDERSTANDING OF THE JENNINGS BELL SLOT MACHINE”. I'm offering this manual in two versions. The black & white version is a bit cheaper to buy but the color version has better looking pictures. Both versions have the same information in them. Black & White version for $29.95 plus shipping. COLOR version for $39.95 plus shipping. Good job , thank you for this great job. it's a good idea to have took time to explain this two specials slot mechanic. Thank you sir for the nice comments. I'm afraid I don't know what postage will be to France. These are printed in Scottsdale, Arizona and you will be ordering directly from the printer. You will have to check the ordering page to calculate shipping charges to France. If you have a way to sell additional copies, I suggest you order several copies and pay one shipping charge. It would probably save quite a bit of money over shipping each book individually. Thought you might like to see a sample of what's in the book. Here are the first two chapters. If you're still interested, I just posted both versions of the book (black & white and color) up on eBay for international sales. Thought you guys might like to see a few of the pages in the COLOR version of the book.